The new TEC 805 glue gun is an all-electric, industrial high quality tool that is both robust and lightweight with a high glue output of over 1.8 kilos per hour of molten adhesive. The TEC 805-12 incorporates a narrow profile aiding visibility and manoeuvrability which allows the molten adhesive to be placed with high accuracy. The full hand lever trigger can be adjusted for optimum comfort and can deliver different amounts of glue from each pull of the trigger. The TEC 805 Tecbond glue sticks and boasting a fast heat up time of only 3 minutes from cold and an illuminated on-off switch the TEC 805 is quick and easy to use. Its multifunctional detachable stand not only provides a steady base for the gun, but incorporates a wrench allowing replacement of the nozzle. 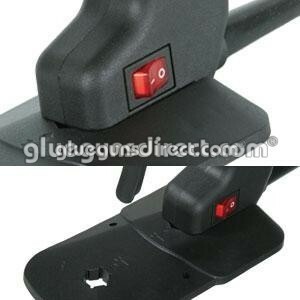 The stand also houses the trigger stop adjustment screw. The TEC 805 gun combines quality with cost efficiency and provides a professional mid range gun to be used for most gluing applications. 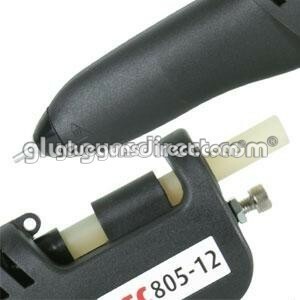 Tec 805 is available in 12mm, 15mm and Low Melt for the job in hand and is covered by our Tec glue gun warranty. Have an old or broken glue gun? Don’t throw it, exchange it for a new Tec 805 with a 12 month warranty for a greatly reduced price.